How Have People Used Springs? A positve reaction to the sight of permanent, and clear water, flowing spontaneously out of the apparently solid ground is not just a human trait, but is somewhat instinctual to all land creatures. Nearly all animals require dependable water in their home range--a requirement which is sometimes filled by a stream, but streams themselves rely on springs to maintain their flow during times of drought. Because of the constantly upwelling movement, and relatively warm water during the winter, springs are unlikely to freeze over completely. Human water needs are no different, and people have based their settlements around springs since time immemorial. Springs are still considered an asset to a farm, providing water for livestock now as they did then. But unlike their animals, humans have used springs for many different purposes besides just drinking, bathing or cooling off during the hot Midwestern summers. Probably because of the mysterious nature of springs--some providing nearly constant flow, some flowing with a repeatable cycle of highs and lows, and the moods evoked as a spring changes with the weather and the seasons--springs are among the earliest known sacred sites. Whether looked upon as the residence of water spirits, or expressions of the natural fertility of the planet (because of the buffering effects of the water, some plants in spring basins remain green year round) the soothing natural music of the running water calms the soul and provides a meditative environment for reflection, both literally and figuratively. Once a campsite, cabin or homestead was established at a particular spring, the other advantages of spring water became apparent. Probably by accident, someone discovered that perishable foods did not spoil so quickly when they were kept cold. Springs furnish an abundant supply of cool to cold running water. Because of the cooler water temperature, the surrounding air is often cooler as well, and an enclosure surrounding the spring can take advantage of this, providing natural refrigeration for fresh meat, milk, eggs --and watermelons! Spring houses are a now vanishing relic of these days before mechanical refrigeration. Although the native peoples used springs for irrigation and navigation, and took advantage of the ponded water produced by beaver dams and the like, it is unclear if they used the springs as sources of mechanical power. 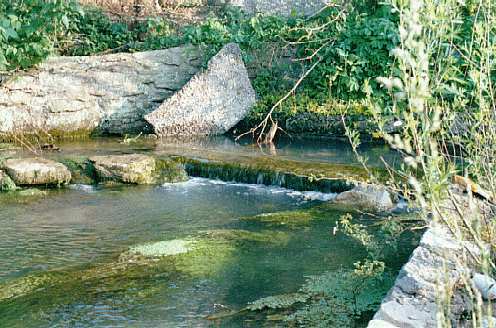 White settlers, familiar with water powered grist and sawmills in Europe often preferred spring branches for their mills because they were smaller, easier to dam, and somewhat more predictable than rivers, whose flooding rampages typically brought much more destructive debris with the increased water flow. Bigger was not necessarily better when it came to spring use as mill powersites. 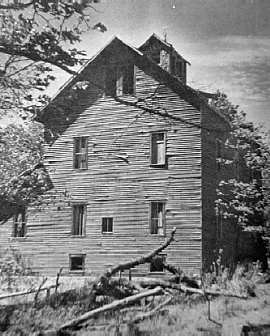 Factors such as easy accessiblity from wagon roads, a suitable building location safe from the branch during flood, and enough of a population in an area to support a miller also played a part. 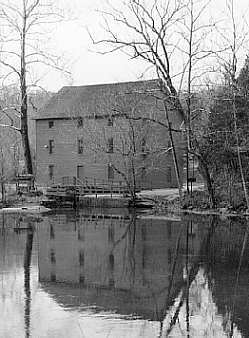 The design of the mill depended upon the placement of the spring--submerged turbines were used in a traditional dammed spring and millpond setting such as at Alley Spring, whereas a small spring high on a bluff called for a flume and overshot water wheel arrangement, such as that at Turner Mill Spring. 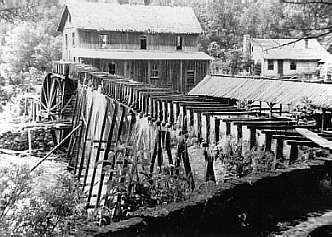 Perhaps the ultimate example of "Ozark engineering" was used at Greer Mill, where the milldam and turbine remained in the deep ravine of Greer Spring branch, and the power generated was transferred three quarters mile uphill to the mill via cables and contraptions known as shiftstands, thus affording Greer the best of both worlds--the mill stood on a well traveled road, far from any danger of flooding, while the harnessing the power of the second largest spring in the state. As the water milling era gave way to that of electricity, several of these springs took on the additional function of electrical generating plant. Mammoth, Alley, Falling, Althea and many other springs generated electricity for their owners, and nearby residents. Mammoth Spring, with its high dam and location in a thriving town probably made the most difference before the coming of REA electric to the Ozarks. It was during this era that the mineral spring and spa business prospered. The use of springs for purely recreational resorts for sportsmen and city dwellers became popular during this era, and the first state parks were established in the mid to late 1920's. Of the first 12 parks and two historic sites in the state park system by 1928, ten of them featured springs-- Round, Big, Alley, Bennett, Roaring River, Chesapeake, Montauk and Sequiota Springs, along with the not inconsequential karst and spring resources at Meramec State Park and the historically significant Santa Fe Spring at Arrow Rock State Historic Site. Most of the large Ozark springs were stocked with trout for the enjoyment of fishermen; Bennett, Roaring River and Montauk, as well as Chesapeake and Sequiota Springs were (and all but Sequiota still are) fish hatcheries. Many Ozark springs have done duty as lodges, campgrounds and resorts. Nearly all of the springs along the Jacks Fork, Current and Eleven Point Rivers are now in some sort of protected ownership, whether as part of a national scenic river, a state park, or private stewardship, with the intent to preserve the spring and surrounding area. Bennett, Montauk, and Roaring River are state parks whose activities currently revolve around trout fishing, as is the privately held Maramec Spring Park. A spring on one's property increases its value--check any real estate ads in outstate Missouri, and you will find the existence of a spring mentioned prominently. Some of the odder uses for Ozark springs include as "pure Ozark Mountain spring water" for the making of moonshine liquor, aquatic plant farms, where people grow edible watercress for sale in stores, and plants for aquariums. Except for the mineral spa folks, and the Mountain Valley Water plant in Hot Springs, Arkansas, Ozark springs have not been well-known sources for bottled water--a proposal to establish such a plant at Greer Spring in the late 1980's never really got off the ground. Springs have commonly been the sites of baptizings, picnics, revivals, and other social gatherings, and still draw people to themselves with an almost magnetic pull.